Everyone who knows me knows I’m a huge fan of old movies. I’d like to tell you about a movie called "The Thrill of it All". It stars Doris Day and James Garner as Dr. Gerald and Mrs. Beverly Boyer. Doris Day plays a 1950’s housewife married to an obstetrician. One of James Garner’s patients is the daughter of the owner of a soap company. This daughter finds out that she is expecting. She and her husband have been trying for years and years and they are ecstatic when the doctor breaks the news to them. They invite the doctor and his wife to dinner that evening. He calls home to tell Doris Day to get ready, he’s taking her out to dinner. Well, she had a roast in the oven and two kids needing baths and it was just pandemonium. How could she possibly get ready in time? The kids wouldn’t wash their hair in the bathtub because they said the soap “smells like pine tar”. So, Beverly brought out the special “Happy” brand soap and the kids loved the smell. They proceeded to finish their baths and Mom was able to get ready to meet her husband in time for an evening out. They go to the owner of the soap company's house and come in while they are watching the latest commercial for the soap on the TV. Back in those days, remember, TV commercials were live. So, they come into the dining room while everyone is watching the commercial and sit down quietly. The commercial ends and there is some grumbling from the patriarch of the family/company owner. Out of nowhere Doris Day says to the table “That soap saved my life today”. Well, that got the owner's attention. He asked her to explain. She did and he loved her natural approach to selling his product. He offered her a job to go on TV to sell his soap. The rest of the movie involves role reversals, gender politics and wouldn’t be very politically correct today, but it’s an amusing and enjoyable film. I won’t spoil it for you, but will say you will love it. There's a swimming pool full of bubbles. It’s worth it just for that alone! Anyway! There is a purpose to this story! 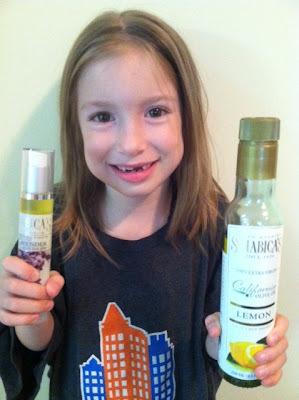 So just as Happy Soap “saved her life”, so did Sciabica's Lavender Olive Oil save mine. On more than one occasion! I had been having trouble with dry skin on my daughter Morgan's scalp for a while. I brought this up to a friend, Louise , and she sent me some of the Sciabica Lavender Oil to use on her scalp. Wow! It worked like a charm. I just massaged some into her scalp and was able to comb out the dry patches with ease and no discomfort. I used it for a while until her scalp cleared right up. Then one night last summer, when my daughter was attending vacation Bible school at a nearby church, I got a call. “Your daughter has gum in her hair and we cannot treat her ourselves. You need to come pick her up right away.” Well, I wasn’t going to let a little gum deter me! So, I grabbed that bottle of Lavender Olive Oil and drove up to the church. I sat down with her, put 2 drops on that area of her hair, and proceeded to comb that gum right out. She was ready to go back in within 3 minutes and didn’t have to go home early! More recently, I allowed my daughter (ok, I put it there myself) to put one of those temporary tattoos on her face. Well, that was all fine and good on the weekend, but she had to go to school the next day. I had to get that sucker off and if you’ve ever tried to just wipe it off with a paper towel and water you will know that it doesn’t work. I had just received the Sciabica Lemon Olive Oil and thought “Well, why not? And she’ll smell good too!”. Sure enough, it worked. Came right off with a few wipes. P.S. Sciabica's Olive Oil also works on creaky doors. I have the squeakiest front door. It's been like that since I moved in back in September, last year. I've never done anything about it until one night a week ago. I decided to put some Sciabica Olive Oil on a paper towel and I rubbed down the hinges. Not a squeak has been heard since. Another P.S. I recently laid waste to my body in the harsh reality of a day at the pool with minimal sunscreen. Four hours! My body was not happy and I was miserable for over a week. I was advised by our dear colleague, Carol, to use Lavender Oil so I applied my Sciabica Lavender Oil to ease the sting and moisturize the areas. It worked great. I am still applying the oil to wet skin every day upon exiting the shower. It's a great way to moisturize your skin ANY time of year! Aims, you are making me laugh! And you are very wise. I love all of your different applications. Olive oil, it's not just for cooking! My door STILL doesn't squeak! Morgan is adorable! And Aimee sure is teaching her well! It's the best olive oil I have ever used. I have never enjoyed any other olive oil since I have used it. :) Try the jalapeno olive oil in gazpacho....too good. Jalapeno oil in gazpacho sounds fantastic! And we are right there with you! Sciabica puts other olive oil to shame! We started out as cooks being challenged with a product. Now we are all customers for life!